This post originally appeared on the CLIR Re:Thinking blog. The Collective conference bad. Author’s photograph. The third point, making it fun, was not as straightforward as I expected. True, the schedule included a number of engaging social opportunities: small pre- and post- workshops, informal “dine arounds” in Knoxville, and the (absolutely remarkable) dinner and reception at the Mill & Mine. Still, while enjoyable, I would not say that any one event generated “fun” in and of itself. Rather, I keep thinking of the swag-bag hamsters. As I sat at a table waiting for the keynote, I jokingly asked others at my table what they thought the hamsters signify. Without missing a beat, a librarian to my left suggested it is a representation of thinking outside the box. Yes! We laughed and pushed the interpretation further— to think outside the box, to meet the unknown future needs of libraries and patrons, we need to work together, to bolster each other up, to collaborate. This message could have been communicated in any number of ways; yet, like the wink of an inside joke, we realized the hamsters are us. This humor—encapsulated by the graphic, by the presence of a tech-free “shhh room,” by the play and discovery encouraged in the popup makerspace—was silly, but self-aware. And it only worked because the organizers, volunteers, and presenters so wholeheartedly embraced the mission of collaboration and the values of dialogue and professional support that they generated a shared sense of purpose and community that extended to all participants. Cross-posted on the Digital Scholarship Center blog. In architectural history and archaeology, geographic information system (GIS) programs are useful for mapping sites, geo-referencing plans, and analyzing data. Inspired by the work of Edward Triplett, I used ArcGIS to map the viewshed for St. Magnus Cathedral (c. 1137). Viewshed is the area that is visible to a person or agent from a plotted point, and the resultant data shows what is (or would have been) visible from a given location. Visibility and inter-visibility between sites are important themes in landscape and architecture studies, especially as they pertain to spatial orientation and organization, territory and resource control, and symbolic and physical relationships. Combined with architectural and literary information, viewshed analysis offers a way to reevaluate and even hypothesize historical landscapes. 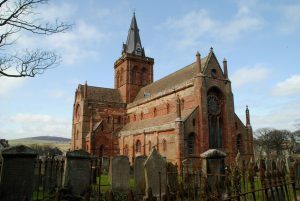 The application and theory of viewshed have been developed for decades, especially in archaeology, and has been explored extensively elsewhere; the point of this two part blog is to 1) outline how I generated my viewshed and 2) discuss how it informed my research on St. Magnus Cathedral and the medieval landscape of Orkney, Scotland. Viewshed analysis should be the start of critical inquiry, an additional piece of evidence to study rather than an end in itself. The accuracy of viewshed analysis can be limited by the quality of data provided by the digital elevation model (DEM) and personal measurements used, and the resultant data does not take into account possible obstacles that can inhibit views, including trees, human-built constructions, and atmospheric conditions. 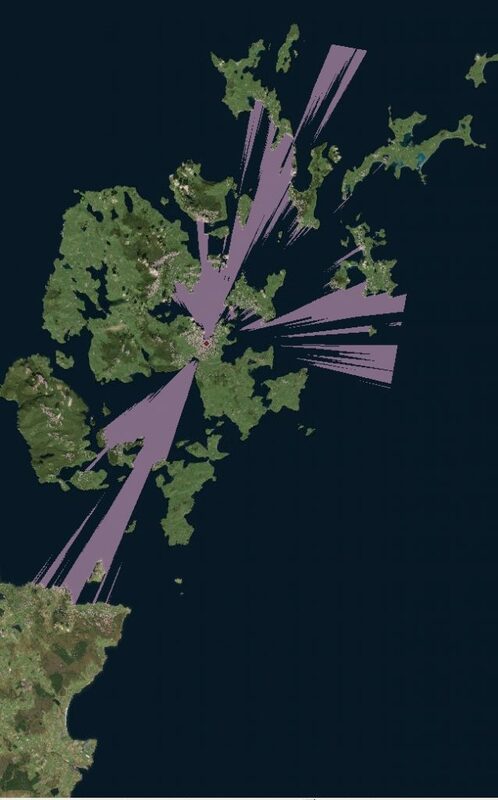 The Orkney Islands—where St. Magnus Cathedral is located—offers its own unique disadvantages and advantages for viewshed analysis. On one hand, Orkney’s weather and atmospheric conditions are rarely clear, and coastal erosion/reclamation efforts have undoubtedly changed the islands over the past 1000 years. On the other hand, the islands lack forest cover, and the many surviving ruins in the landscape from Neolithic to modern age suggest little alteration to the interior of the islands. The software does not recognize the analysis as a subjective point of view within a three-dimensional landscape. Rather, it uses an algorithm and elevation data in the DEM cells to determine which other cells/elevation heights would and would not be visible from a particular place and height. It is therefore important that you understand the landscape, your sources, and what the viewshed analysis can and can’t tell you when working with this data. I began experimenting with viewshed analysis before I had the chance to travel to Orkney myself, and my initial research question was open ended: what is visible to a person standing on the crossing tower of St. Magnus Cathedral? Viewshed analysis of St. Magnus Cathedral, which is located near the center and marked with a small red dot. My DEM files derive from Advanced Spaceborne Emission and Reflection Radiometer (ASTER) and are divided into pixels of raster data representing elevation. The data for Orkney was particularly problematic because it was spread across four separate data grids. With the help of a GIS specialist, I was able to download these four separate grids and mosaic them into one layer to ensure an accurate viewshed. Next, I used a satellite basemap to find the location of St. Magnus Cathedral’s crossing tower and added a second layer consisting of a single point over it. This point determines the point and elevation data used for the viewshed. Without any adjustment, however, the point will generate a viewshed at ground level. To account for the height of the tower, I changed the point’s Offset A attribute to the approximate height of the tower. The height of St. Magnus Cathedral varies in secondary literature, so I selected the measurement (and Offset A) of 133 feet (roughly 40 meters) from the nineteenth-century work of Sir Henry Dryden, who visited and sketched the cathedral before a new, taller spire was added. The generated viewshed appears in pink on the viewshed to the left, visualizing not only what is visible from that point at that height, but also from where the tower itself could be seen. (left) The northwestern view from the tower of St. Magnus Cathedral; (right) St. Magnus Cathedral from the Pentland Firth to the south. I later tested the validity of the data on the ground by tracking when the cathedral became visible from multiple locations and recording the view from the tower myself. St. Magnus Cathedral’s viewshed orientation toward the sea helped to narrow my research question and prompted my second viewshed analysis, which I will discuss in a second blog post. Over the past year, I’ve been following the use of digital tools to reconstruct destroyed or politically charged monuments. Blog posts concerning my own experiments and those of my collaborators can be found on my personal blog or the Scholars’ Lab blog. While the crowd sourced site Rekrei and artist Morehshin Allahyari have focused on how these technologies can reconstruct and preserve these monuments and their data, the Nefertiti Hack and traveling Palmyra Arch (now in New York City) indicate how ideologically charged these ‘copies’ can be. The potential to use new technology to share and preserve monuments is well attested, but there has been growing concern for its uncritical application. While discussing the ethics of digital preservation efforts in Syria, Sarah Bond noted that the decontextulization of such monuments may in fact engage in a type of digital colonialism, especially when the reconstruction process is not transparent and the data itself is not shared. Yet, another symptom of colonialism is cultural collecting; exotic artifacts and plaster casts have made up the collections of powerful western individuals and institutions for centuries. Today, however, we can capture, reconstruct, and share these monuments with increasing ease and speed as more individuals and institutions make their models available for download and 3D printing. On one hand, the accessibility of these collections is fantastic and provides new ways for scholars, students, and enthusiasts to experience and handle replicas of distant artworks. On the other hand, the isolation of these prints from the original and its context, as well as the limitation of printing size and materials, can encourage new cabinet of curiosity mentalities (more than once I’ve heard people refer to these prints as ‘toys’). Regardless where the artworks come from—on my desk alone I have an odd miniature collection consisting of a red St. Basil’s Cathedral, an iron Viking-Age axe, and a gray bust of Caesar—the accessibility of these works is changing how we encounter, engage with, and collect works of cultural heritage. 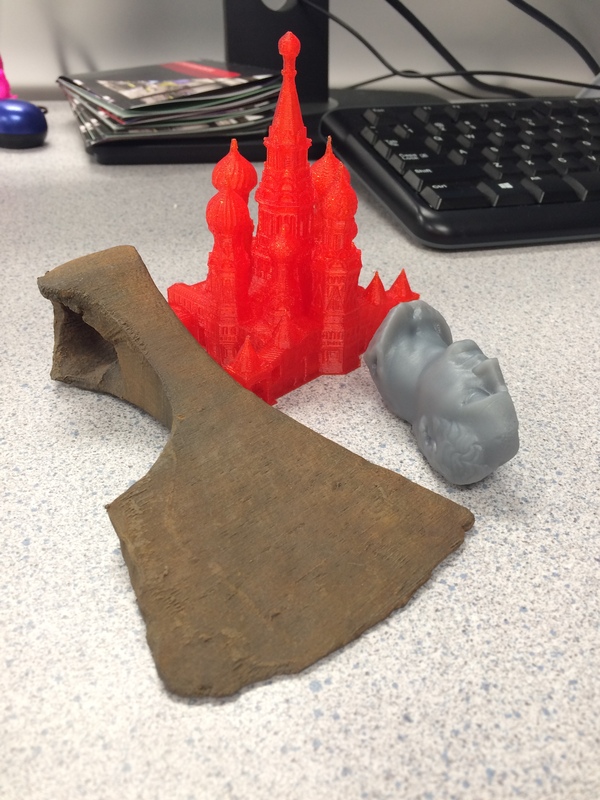 3D printed ax (by Snorri), cathedral (by Olooki3D), and bust (by The British Museum). While I continue to experiment with materials and scale to enhance the value of these 3D prints as educational tools, I increasingly value opportunities to collaborate with instructors to develop authentic learning experiences and relevant assignments that prompt critical thinking about the production and consumption of this surplus of 3D cultural data. Last year, for example, I worked with a Slavic course to design a 3D printing assignment that questioned the relationship between icon and object (the instructors wrote three blog posts outlining, evaluating, and reflecting on their experiences). During the assignment, the cultural weight of one particular object—a bust of Stalin—caused controversy within the department. The bust was small, poorly printed, and made of plastic—so decontextualized from its original function and meaning that the students thought nothing of it. Nevertheless, the presentation of the model within the students’ exhibition prompted backlash due to Stalin’s atrocities. While we removed the bust at that time, the experience provided a relevant teaching moment for the students to consider not only the reproduction and interpretation of such monuments, but also how the meaning of these copies can change based on the background, experiences, and interaction of their audience. Building on that experience, I collaborated with Nicholas Genau this past summer to design a course on cultural heritage and technology for the Curry School of Education’s Summer Enrichment Program. Our course, entitled “3D Monumental! : Preserving the Past With Technology,” was designed for high school students and was taught three times during three separate two-week sessions. The goal of the course was to introduce the students to the necessary skills to produce their own models and think critically about the context, function, and biases of their models. In addition to learning photogrammetry, basic 3D modeling, and 3D printing, the students engaged throughout the course with three “big ideas” that would help them engage critically with their own models and apply their experiences to other digital preservation and reconstruction efforts: (1) how technology helps to map, reconstruct, and share cultural heritage, (2) how technology continues to affect issues of accessibility, ownership, and experience, and (3) how technology makes preservation of cultural heritage a global/political issue. We originally intended to concentrate on the destruction of monuments in the Middle East by contributing to Rekrei, but we discovered that this project was not intuitive enough and did not have enough resources for us to meet our objectives on such a tight time-frame. As a result, the students worked within the context of our own immediate landscape, using monuments and objects located on campus for their models and applying key concerns and themes to Syrian examples. Using the students’ immediate surroundings provided an added benefit: students were able to compare more critically the real-world spatial experience with their object and their interaction with the 3D model and print of that object. The students quickly grasped the basic theory and practice of photography and photogrammetry. We started by taking photos of objects on SEP’s campus, such as trees, cars, and wheelbarrows—whatever was in the immediate vicinity. The students’ excitement when the point clouds appeared in PhotoScan was palpable; they immediately appreciated their role in making the model, the ability to study and manipulate something familiar to them within a new context. The students also grasped the workflow easily: taking photos (using a painter’s pole for larger objects), uploading and masking photos, generating point clouds and texture, and uploading finished models onto the course Sketchfab site, where they could share their work with their families and friends back home. The highlight of the course was a visit to the University of Virginia, where the students generated models of campus monuments and visited the Scholars’ Lab to edit and 3D print the results. Students used Meshmixer to reorient their models (or models of other artifacts they found online), fix any holes in the mesh, and generate supports. We introduced the 3D printers and talked about 3D printing King Uthal from the Mosul Museum, the Temple of Baal, and the Palmyra Arch of Triumph, all examples they studied in the classroom. Although the students couldn’t stay for the entire time their models printed, we brought in the finished prints on the final day of class to compare and discuss. On a pedagogical level, the students engaged in critical making, experimented with new technology, shared their efforts with a broader community, and applied their new skills and knowledge to evaluate cultural heritage developments in the world. While the technology and project enhanced our course content and objectives, we were thrilled that they also contributed to the students’ positive experiences. Still, it was impossible to evaluate how critically the students approached 3D models and printing after the course. While our aim was to teach the students to consider the potentials and limitations of their models as they made them, their delight at the transformation from model to print reminded us how effectively 3D printing engages viewers, especially when watching one’s own creation come to life. We’d like to think, however, that introducing the issues and encouraging personal experimentation will empower these future students and scholars to continue questioning how technology affects the world around them. Moving forward, Nicholas looks forward to developing similar courses for university students, thinking critically himself about how he can better evaluate the projects and improve the students’ own engagement with the course material. Whether we can compare the act of choosing, constructing, and printing a 3D model of Thomas Jefferson to the similar process of printing a miniature bust of Stalin or the Palmyra Arch is debatable (and involves a deeper political argument). Nonetheless, the new speed, ease, and accessibility of 3D printed reproductions has serious implications for scholars and instructors. As 3D printing becomes cheaper, faster, and more ubiquitous, the conversation will need to shift from if or how we can 3D print cultural objects to why would we want to. We were more interested to see the written course evaluations because Prof. Urbanovich emphasized that students should mention the 3D projects as part of their evaluation. 31 of the 35 students submitted those written evaluations during the final exam! Of those, 17 mentioned the 3D project. Of the 17 that mentioned the 3D project, the average score for the course was 4.941 (out of 5); the overall average for the course was 4.548, so the evaluations that mentioned the project gave the course a higher rating than evaluations that did not. Course ratings remained high even among students who did not find the project very meaningful. – A more detailed explanation of the goals and aims of the project, and more discussion of the groups’ presentations and final papers. – In general, more in-class discussion of the symbols that students chose; Prof. Urbanovich noted that the most useful class meetings were the ones driven by student discussion, rather than instructor lecturing. – Pursuant to that, a teaching assistant or “project leader” who would not only introduce the project and work with students to print the models, and guide them through the exhibit-building and presentations, but would also facilitate bi-weekly in-class discussions relating symbols to that week’s topics. – Possibly leave room for comparison of U.S. and Russian symbols expressing a particular idea, and greater room for discussion of how Russians symbolize the U.S.
– More discussion of the various meanings conveyed by 2D symbols, as opposed to 3D symbols. If we had to describe this project in two words or fewer, we would definitely do so using the phrase “learning process”. Two days after the original blog post about the project and the accompanying exhibit went live, we had students curate the exhibit of their objects in the hallway of the Slavic Department, on the second floor of Cabell Hall. We had arranged for use of half of a display case that had been occupied by faculty books and items of Slavic ephemera, which we had permission to remove and re-arrange as needed. Students putting the final touches on their exhibit. The exhibit curation coincided with the Slavic Department’s biweekly Russian Tea & Conversation event, in which students, faculty, staff, and community members interested in speaking Russian or learning about Russian culture gather to eat, drink tea, converse, and occasionally listen to speakers on special topics. The 2470 students brought their objects to this event, and after a brief introduction to the project from us, they presented their objects to the group and explained why they chose the objects they did. The students then took their objects to the display case and set up the exhibit (for which we had printed a brief blurb and some attributive text). General response to the project, and the objects, at this event seemed positive, which is why we were quite surprised the next day to hear that one faculty member had a very strong negative reaction to one of the objects in the display case. After some deliberation, we decided to remove the object from the exhibit, and a few weeks later (due to class not meeting because of Spring Break) we discussed this reaction with the students in class.The exhibit curation coincided with the Slavic Department’s biweekly Russian Tea & Conversation event, in which students, faculty, staff, and community members interested in speaking Russian or learning about Russian culture gather to eat, drink tea, converse, and occasionally listen to speakers on special topics. The 2470 students brought their objects to this event, and after a brief introduction to the project from us, they presented their objects to the group and explained why they chose the objects they did. The students then took their objects to the display case and set up the exhibit (for which we had printed a brief blurb and some attributive text). The object in question was a bust of Joseph Stalin, which the group printed in red. The faculty member who raised the objection is well-known for his work on Stalin’s system of forced labor camps, known as the Gulag. His most recent book on the topic features an image of Stalin on the front cover, which was displayed in the same case in which the students’ exhibition was curated. For an American student whose only experience of Stalin comes from textbooks, using this bust to represent Russia was a positive choice, because Stalin is seen in the U.S. as a strong leader who helped defeat Hitler during World War II. For the objecting faculty member, whose family has personal experience with the effects of Stalin’s policies, the bust carries entirely different connotations: genocide, violence, and turbulence. When we shared this with the entire class, the group that printed the Stalin bust maintained that they stood by their choice, and some of their classmates expressed the common sentiment that Germany is not usually characterized only by Hitler’s negative aspects, so why should Russia be characterized only by Stalin’s? We wanted to emphasize that the students were not in trouble, nor were their project grades affected, and we led them through a discussion of the ways in which their objects can be interpreted as symbols by different groups with various degrees of distance from those symbols. This discussion raised some salient points about the effect of a two-dimensional representation versus a three-dimensional representation, and (for us, at least) really drove home the point that 3D objects absolutely can bring symbols to life in new and unexpected ways. The finished product. Note the placement of the Stalin bust next to the book at the left. About a month after that discussion, towards the end of the semester, we gave students the option to re-print their objects if they wished, since at least one group had expressed interest in doing so – the group that printed the Rubik’s cube, for example, had thought about re-making their object to have movable parts. None of the groups chose this option, and headed into the work of their final projects with their original objects intact.The final project asked groups to complete two assignments. First was a 1,000-word essay addressing the ways in which the group’s view of their object changed, highlighting the following questions: In what ways does your object serve (or no longer serve) as a symbol of Russia? What might better symbolize Russia, or how could your symbol be improved? Did you have any misconceptions in your initial plan to work with this object? What were they? Where did they come from? Is this object ‘loaded’ with any preconceived notions from a Western perspective? From a Russian perspective? The second assignment was to create and give a 3-minute presentation addressing the following questions: What do the objects chosen by the entire class, and the ways the class arranged those objects, say about how we view Russia? What do these objects have in common? How do you think Russians might symbolically represent their views of the United States? Generally, student groups were satisfied with their objects as symbols of Russia, though each group recognized shortcomings in their initial conceptions of their objects and was able to articulate ways to make their object a stronger symbol. The Stalin group, for example, would have printed a figure of Stalin to represent him as a human being, rather than as a figurehead or an icon on a pedestal, based on the visceral reaction to the bust that could be seen as “glorifying” a figure whose history is murky at best. The group that printed St. Basil’s cathedral felt that their object lacked political symbolism, which they would have changed by adding a 3D model of the Kremlin to surround the church. The onion dome group offered two ideas for improvement: first, making their onion dome a dynamic object with multi-colored layers that represent what they call “the multiple forces at work in Russian society”, or second, printing a model of a nesting doll (matryoshka) to represent the seemingly outwardly-united Russia that depends on one leader at its core. The group with the Soyuz rocket would have changed the color of their object; rather than the white that represents Russia’s multicultural identity, they would have printed a red rocket to emphasize the importance of Communism and revolutions in Russia’s history. They might also have added an astronaut to the rocket, or adorned it with embellishments, to portray Russian opulence created by human hands. The Rubik’s cube group had initially expressed a desire to enhance their object with moving parts; this desire still held true at the end of the semester, though an acceptable compromise would have been to scatter the colors throughout the cube so that it did not have a uniform appearance and could thus express their claim that the puzzle that is Russia has not yet been “solved” in their lifetimes. Finally, the group that printed the scales stated that their object could have been more meaningful if the scales had been movable, rather than fixed, and if each side had had multiple boxes that could be moved to portray the fluctuating power balance between the U.S. and Russia. As a final note, a few days after classes ended for the semester, I (Kathleen) came across a link on my Twitter feed to a story about upcoming Victory Day celebrations in the Siberian city of Novosibirsk. (Russians celebrate Victory Day every May 9 to commemorate the end of World War II, which they refer to as “The Great Patriotic War”). The story focused on a set of billboards being erected in the city for the celebrations, all of which prominently featured images of Joseph Stalin. This story adds another twist to our discussion of the use of Stalin as a symbol of Russia; for many Russians, he is still seen as a positive figure in the country, despite his treatment of Soviet citizens during his rule. Like the Russian matryoshka doll, the use of Stalin as a representation of Russia is complex and multi-layered, and can be unpacked and re-arranged in a myriad of ways. In our next post, we will address which parts of this project worked and which did not, students’ and the instructor’s final thoughts on the project, and ideas for improving the implementation of such a project in the future. From a pedagogical perspective, the differences between these print labs presented both opportunities and challenges—and I made a number of very significant mistakes of my own along the way. Chief among the latter was the assumption when I designed the course syllabus that students would have easy access outside of classroom hours to JMU’s 3Space printers in order to print their projects, particularly if the individual object was complicated and would take a long time to print. I incorrectly assumed that they had the same relatively open-access policy that the UVA Makerspace applied to its printers. This meant that I had to schedule extra hours—as it turned out, on a Sunday—for the students to print their group projects. I also had to scale down the requirements for the final group printing project as a result. The size of my class and its need for extended formal training were also issues that I should have anticipated through better coordination with the friendly and helpful people at JMU’s very interesting and supportive Center for Instructional Technology, which runs the 3Space Lab. I am grateful for the patience, enthusiasm and dedication of the staff members in both the Center for Instructional Technology and in the Scholar’s Lab, especially Jamie Calcagno-Roach, Jennifer Grayburn and Shane Lin. Perhaps the most important question is—was there an actual educational benefit to incorporating 3D printing into the class (other than that it was fun)? Did the students understand the intellectual connection between 3D printing, Daesh’s cultural heritage destruction and the reproduction of memory? As the museum exhibition artist Gary Staab recently said in a Smithsonian Magazine article that described an exhibition model in which he combined his own sculpting with 3D printing to recreate the Neolithic mummy known as Ötzi, “I also find the physical act of making stuff is such a great memory aid. If you want to learn something, you draw it. If you want to know it, you sculpt it. If you have to physically make it in three-dimensions, that burns it into your memory and those facts stay hard and fast,” (Wei-Haas 2016). Three-D printable objects are mneumonic devices, acting as tactile, visceral, ontological connections to their progenitors while also incorporating something new: the labor of the student who reproduces, remembers, touches and observes these objects, physical phantoms of their former selves. The student physically contributes to their memory and reproduction, and it is this, I think, that makes them powerful tools not only in the classroom but as a global tool for fighting the kind of destruction promulgated by Daesh. With 3D printing, memory of sites and objects isn’t just widely distributed, observed, studied and remembered; it has to be actively physically reproduced with time, materials and labor. Each act of reproduction individually chips away just a tiny bit at the destructive force that obliterated Version 1.0, empowering the maker, the memory and the other globally-distributed reproducers. Ömür Harmanşah (2015) points out that Daesh’s destruction isn’t just iconoclasm; it is more like reality TV, an ever-escalating attempt to grab the world’s attention by enacting The Unthinkable. This also humiliates populations whose pride is intertwined with protecting and remembering local monuments in front of a global audience, like schoolyard bullies who tease those they perceive as weak in front of their peers. Like schoolyard bullies, the best way to shut down aggressors is for everyone, united, to join together in opposition, to respect and remember the individuals, sites and objects they attempt to desecrate, both ancient and modern. Obviously our priorities today must fall firmly on the living people who are suffering the deprivations of warfare and occupation; but it’s important, too, to remember that the value of these sites and objects doesn’t really lie in their physical remains. It lies in the fact that this is all we have to remember the dead, to remember the acts of past peoples—workers and kings, everyday families, mothers and children, farmers, travelers and priests—real human beings whose lives are commemorated only by the tactile remains they crafted. Daesh attempts to destroy the honor of the living and the memory of the dead through these acts but the resilience, persistence and memory of the living people of Syria and Iraq is stronger than their oppressors. Wei-Haas, Maya. “An Artist Creates a Detailed Replica of Ötzi, the 5,300-Year-Old ‘Iceman’.” Smithsonian Magazine, February 17, 2016. Accessed 02/22/2016. http://po.st/gy5vhe. To answer these questions, groups of 6-7 students collaborated to choose and print a 3D object that, to them, represents Russia. We chose to have students print 3D objects, rather than simply view photographs or slides, because we suspected that having a tangible physical object that they would have to create and then handle would give them a new perspective on how Russians think of themselves. They presented their objects during the second week of class, along with a brief justification of the object they chose and its usefulness as a symbol of Russian identity. The six groups chose the following objects: a bust of Joseph Stalin, a Rubik’scube, the onion dome of an Orthodox cathedral, a Soyuz rocket, St. Basil’s cathedral, and a set of unbalanced scales containing a white box and a red box on each side. Having the items present in class, and able to be touched and passed around, fostered what we think was a more robust discussion of identity than a set of images on a page — for example, being able to see up close the many intricate parts of St. Basil’s cathedral that make what one group called it a symbol of “chaotic Russia”, where cultures and traditions coexist yet also clash, seemed more meaningful than simply looking at it on a screen. The Rubik’s cube and the scales spurred the most discussion, as students noted not only the scale’s metaphorical representation of a power imbalance between Russia and the West, but also its literal imbalance and fragility as a model (it had to be handled very carefully due to its delicate construction). The Rubik’s cube, which was meant to represent what its group called the “polyperipheral” environment, history, and geography, inspired students to discuss scientific and mathematical components of Russian identity and the ever-present Russian fear of feeling “left behind” in technological advancements.